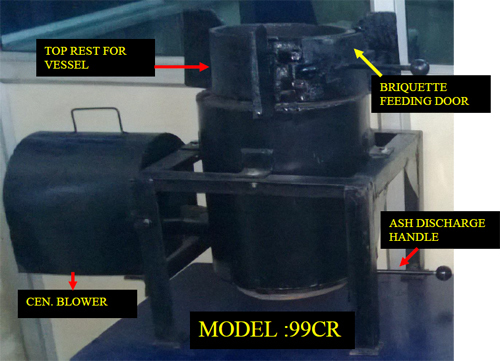 One of the obstacles of lack using for wood briquette that because still no wood briquette stove available in market. Wood briquette stove that special designed for burning the wood briquette so it can be used for cooking is the main factor for wood briquette will be accepted of households and small-medium industries. Food and pharmaceutical industries especially need 'clean' fuel from biomass like wood briquette. Smell and taste of food will no change or contaminant of pharmaceutical industries can be minimized. Supply of the wood briquette also easier to be done because the production process and technology already mastered. All equipments can be fabricated in the local fabricator in Indonesia even extruder or screw press that the main equipment in briquetting. That is different with wood pellet in which pelleting equipment (pelletiser) still have to be imported from foreign countries. The investment for production equipment (machineries) of wood briquette also cheaper compare with wood pellet, even almost a half. For feeding the wood briquette into the stove can be done manually, that because the size of wood briquette much bigger than wood pellet. At wood briquette stove usually installed door in upper part for feeding or inserting the wood briquette. While in the wood pellets feeding can be done with screw conveyor because the size of wood pellet is small enough and pourable. 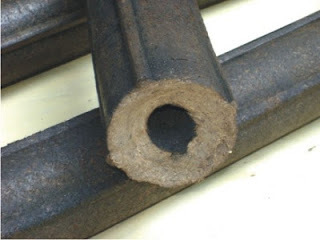 In addition wood briquette also available in many shapes for example cylinder, hexagon, cube etc. 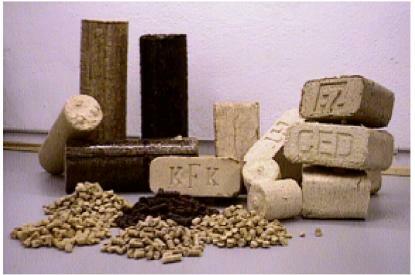 The shapes of the wood briquette come from many briquetting technologies, that can be read here. All of the briquette can use the wood briquette stove as long as the size and length fit with it. Generally briquetting also easier compare with pelleting. Raw material that success in briquetting not always success in pelleting but not respectively. The high stove efficiency can be achieved if heat loss from burning can be minimized. 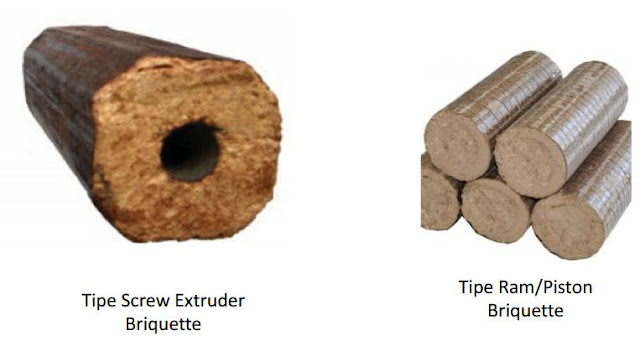 Wood briquette has low moisture content so smoke generated from the combustion also minimum. With wood briquette price cheaper per-heat calory compare with LPG, so using wood briquette also more economical. 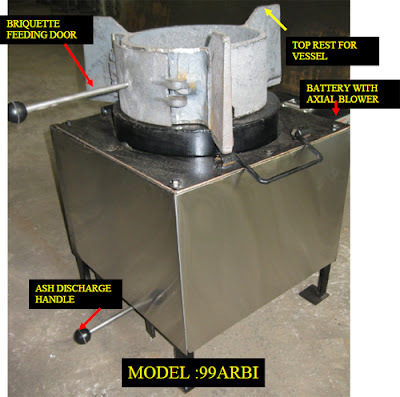 Operational of the stove that easier and practical will drive the usage of the wood briquette. The stove also can be equipped with TEG (Thermo-Electric Generator) for getting small electricity. Beside the wood wastes for wood briquette production, agricultural wastes also can be made into biomass briquette for example rice husk, coffee husk, coconut husk, baggase, palm oil empty fruit bunch, etc. Some of the wastes mentioned before abundant in some Indonesia regions. 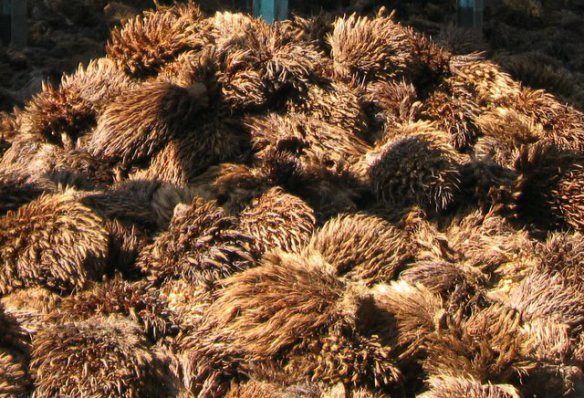 Empty fruit bunch (EFB) of palm oil for example abundant in palm oil mills and more than 600 palm oil mills available in Indonesia. The EFB can be briquetted then can be used as biomass fuel.